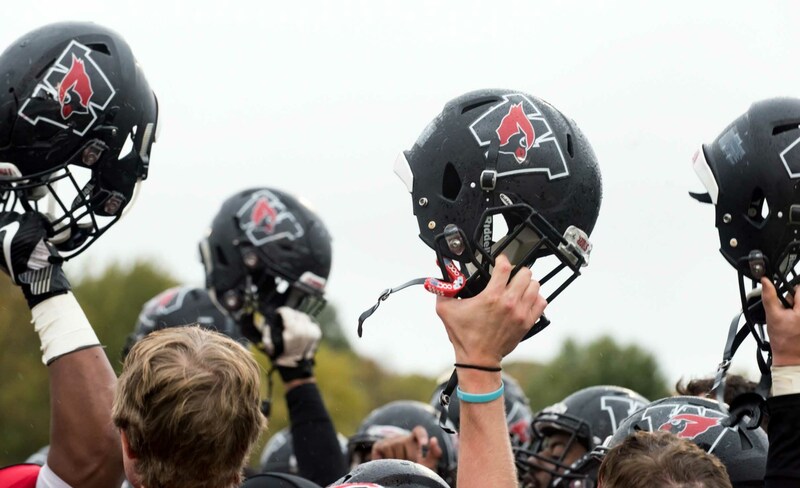 As expected, the Cardinals won big over Bowdoin at home this weekend with a 24-0 shutout, thanks to an improved offense and a stronger defense compared to the ones that showed up the week before in the crushing loss to Amherst. However, Bowdoin was the last easy match of the year as both Williams and Trinity will be tough, important matchups. The offense this week improved greatly, gaining more than triple Bowdoin’s yards and averaging more than double their average gain per play. This week our running game returned in a big way after a tough performance against Amherst, gaining over 200 yards in total and a touchdown from Glenn Smith ’21, who also provided roughly half of Wes’ yards on the ground. The passing game was also fruitful, with touchdown passes to both Hallvard Lundevall ’19 and Matthew Simco ’22. Quarterback Mark Piccirillo ’19 had a great day, though an interception soured what would have been an almost perfect performance. The offense did a great job of converting third downs and continuing drives, something that has been an issue throughout the season even when playing well in the first few games. The defense also regained some of their early season flare this week and forced Bowdoin to punt 10 times in the game on the way to a complete shutout. Danny Banks ’22 snagged an interception in the fourth quarter (which was somewhat undercut by a Wesleyan interception on the ensuing drive). Taj Gooden ’21 dominated throughout the game with a fantastic performance culminating in two sacks and a forced fumble, though it was not recovered by the Red and Black. Brandon Morris ’19 was also a problem for Bowdoin all day, disrupting just about everything the Polar Bears tried to do offensively. Beyond these individual performances, the defense as a whole played well against Bowdoin as the Cards held their offense to 100 yards of total offense and only allowed them to convert a single third down throughout the entire afternoon. Bowdoin does have among the worst offenses in the league, but it is still worth noting just how well Wesleyan did on gameday. However, as the team came back to its usual form and performed well on offense and on defense, it returned to many of its old problems that had miraculously improved last week against Amherst. Once again the Cardinals struggled with penalties and provided Bowdoin with many of their total first downs thanks to a lack of discipline and restraint. Similarly, special teams were utterly underwhelming as they only gained a grand total of 11 yards from both kick off and punt returns. 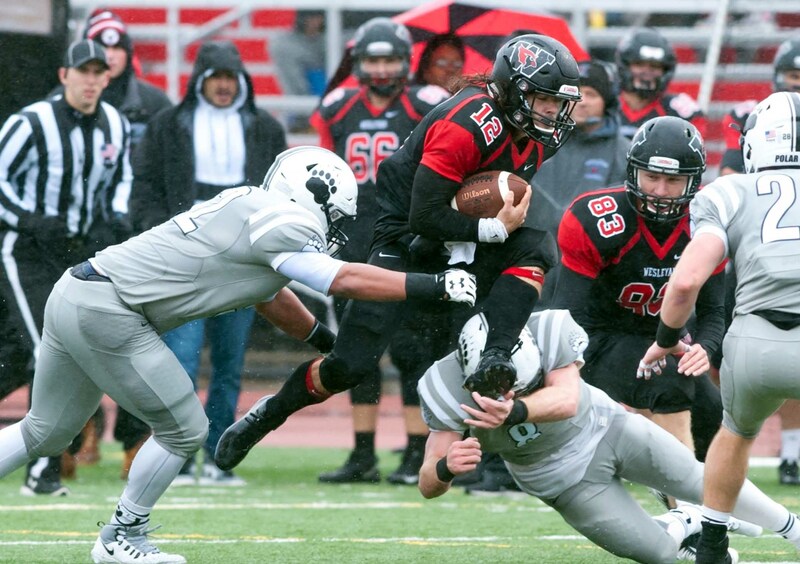 To be fair, Wesleyan did only receive one kick off but Bowdoin punted 10 times, and the Cardinals gained a grand total of eight yards across three returns. That statistic needs to be improved given the number of opportunities handed to the Red and Black by arguably the worst team in the conference. Moreover, Bowdoin was able to gain over 80 yards on special teams, which shows that Wes greatly struggles on both sides of coverage and this needs to be a major area of improvement. That is not to say that the offense and defense were perfect either, as the offense fumbled three times and turned over possession in the Bowdoin red zone while the defense forced two fumbles and recovered neither. The weather was also a factor, but the point still stands. A strong performance which showed signs of a return to the form of earlier in the season is somewhat tempered by a closer examination of both the opponent and the totality of the Cardinal performance on the field. Next week’s match is at Williams where the Ephs will be heavily favored. Wesleyan has a tall task ahead if it hopes to return home with a victory considering how much the Birds have struggled away from home, the weight of the Little Three Rivalry, and the slump that the Red and Black have fallen into recently.